Many lost people, after a proper evaluation of their condition, when they are warmed and have had some food and drink are perfectly capable of walking out. Lost people are often tired after their ordeal, so it is prudent to divide their belongings among the rescue group and to station a rescuer on either side in case they should be unsteady on their feet. Continue to monitor their condition, usually by engaging them in conversation. Exhaustion and also hypothermia are often indicated by unusual quietness and a slurring of speech. If the lost person is unable to walk out, evacuation will usually become a much larger operation. A helicopter can prove very valuable here, greatly reducing the time, effort and number of people needed. 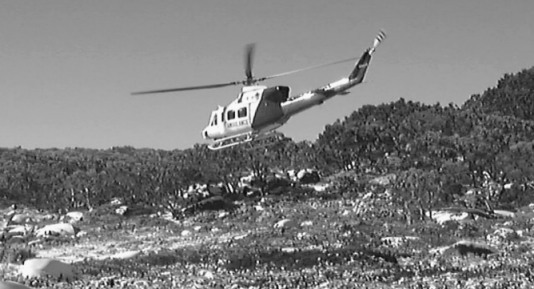 The benefits of helicopter evacuation are; immediate retrieval (either by rescue hoist or landing) allowing for urgent medical attention to be given at the earliest opportunity. Obviously helicopters cannot be used in every situation due to varying factors such as; weather conditions, visibility, terrain (cliffs, dense forested areas, high voltage transmission lines etc). An important factor to consider is the flight time that it may take for the helicopter to attend the location and the time it can remain overhead due to available fuel. As with all aircraft there is an element of danger but with common sense, knowledge and awareness, the risks are minimal. Helicopters can operate in very strong winds, providing the wind is steady. Powerful gusts may make flying near the ground unsafe. If it is safe to do so, the helicopter will land in a clearing to take the casualty on board. A searcher should be stationed in an upwind corner of the clearing with a jacket or groundsheet held firmly above the head to indicate wind direction to the pilot. Keep all other people clear. If the aircraft is unable to land it may be possible to rest it briefly on one wheel or skid, but, failing that, winching will be necessary. A crew member will first be lowered on the winch line, followed by a special stretcher. The crew member will instruct the Group Leader on the requirements for the lift and will supervise the securing of the casualty in the stretchet It would not be possible to accommodate a bush stretcher in the helicopter, nor safe to lift it. Refer also to the notes on operating with helicopters in Chapter 11. Be aware of the dangers of falling debris caused by the rotor wash. A helicopter hovering just above the trees can easily dislodge dead branches onto the ground below. Keep all unnecessary people clear of the immediate area. Take care to protect the casualty. Pack away loose items that could be blown away by the rotor wash. Failing the use of a helicopter to evacuate the missing person, the sometimes long, hard grind of a carry will be necessary. Given the likelihood of bad weather during a search, carrying may be regarded as the norm. 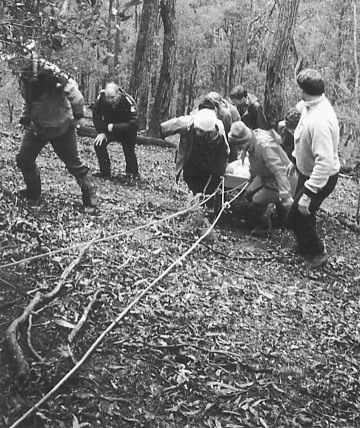 A number of stretcher types are typically used in bush evacuations. Skeds are compact, lightweight versatile units owned by BSAR and Police Search and Rescue, which can be used in the bush or towed as a sled. The bush stretcher has the advantage of being able to be constructed on the spot. Other types may be used, depending upon the resources at hand. The first consideration when a carry is planned is the number of people required. A carry of any length, especially in rough terrain, requires eight stretcher bearers at any one time and two relief crews. Many newcomers to search and rescue are inclined to regard this number of twenty four carriers per casualty as excessive until they have first-hand experience of a long carry, after which they will probably feel (along with all the others) that they did most of the carrying personally. After organising sufficient carriers, a stretcher will need to be assembled. The addition of carrying poles to one of the BSAR’s Skeds (see Chapter 11) could be considered as a quick solution, but only for a short carry because of the lack of rigidity and the difficulties of carrying. In spite of its crude and rustic appearance, it is difficult to improve on the bush stretcher (see Chapter 11) for a long carry. It is reasonably rigid for a comfortable ride, but not so rigid as to put a large stress on any part. It can be quickly made from readily available material and so does not have to be carried around in case it is needed. Most important of all, it allows eight people to share the load. Its building does, however, require a suitable cutting tool (a saw is most convenient, but see below) and a good supply of cord and light rope. Stretcher carrying benefits from a high level of organisation. There must be one person in charge of the carry to synchronise lifting and lowering, to organise relief teams and to generally conduct the carry. Scouts should go ahead to pick the best route, marking it if necessary. Next should come a group equipped with machete, cutting only as required to allow the passage of the stretchet Note that a saw, although the ideal tool for building the stretcher, is useless for this job. The stretcher will be carried by eight people on the bearers’ shoulders unless traversing, when it is usually best to carry on shoulders on one side and hands on the other. The casualty should always be comfortably but securely attached to the stretcher, usually with rope over ample padding. One designated person, with first aid skills, should monitor and record the casualty’s condition. This typically includes arranging for toilet stops, checking their thermal comfort and making sure that branches do not scratch the face. The casualty can wear sunglasses, even at night, to protect the eyes from debris. Motion sickness, which is generally worse when the casualty cannot see the horizon, can be a problem during long carries or sled trips. Turning the casualty on the side or tilting the head to see the horizon can sometimes ease the problem. If the bush is reasonably open and not too steep, the stretcher can be carried continuously at about two kilometres per hour. If the going is hard the pace will be much less. When ascending or descending steep slopes, particularly if the ground is loose or slippery, it is wise to belay the stretcher to a tree or rock. It may then be possible for the carrying group to move down with the stretcher, using the rope to check them if they slip. Moving directly up or down the fall-line may be easier and safer than traversing. Casualty evacuation in snow country may have to be performed by stretcher in exactly the way outlined above, but the use of sleds is usually much easier if the terrain allows. A ski sled (see Chapter 11) can be constructed as quickly as a stretcher and is a perfectly practical arrangement, although a Shed or, preferably, a more rigid sled, provides much better comfort for the casualty. A sled is pulled and controlled by means of a rope attached to each corner. In suitable terrain, the pulling may be done most quickly on skis. In awkward, scrubby country snow-shoes are probably best. Sleds have little lateral stability (Skeds almost none) so they must be steered by the ropes. The remarks above about belaying stretchers apply equally to sleds.